So, in case you’ve been indulging your hermit fantasies on a remote island, The Happy Pear refer to twins, Stephen and David Flynn. Independently of each other, they saw the light and became vegetarians in their twenties. Since then it’s been a never ending journey of learning to live healthier and happier lives. They opened their cafe, The Happy Pear, in their home town of Greystones, County Wicklow, Ireland some ten years ago. So, what did I think? I loved it the moment I got a chance to look inside the book. The ethos and recipes are right up my street. For a start, there’s no mention of “clean eating” and eggs and dairy, whilst limited in their use, have not been banned. The recipes are fresh and exciting, but also simple and nutritious, featuring plenty of vegetables and wholefoods. I found the twins’ enthusiastic style both appealing and infectious. I definitely get the idea they believe in what they do. As in all right thinking cookbooks, this one started with my favourite meal of the day, breakfast. Corn fritters with an avocado salsa caught my eye immediately, but I got most excited about their Vegan Full Irish. At last, a cookbook that uses tempeh. CT used to make tempeh and it’s one of my most favourite things; it has a wonderful texture and good umami flavour. We’ve not really been in a position for him to make it over the last few years, but now we’ve got my rather wonderful dehydrator, it might be on the cards again – put it like this, I’m working on him! The book then goes on to cover recipes for soups, salads, mains, snacks, dips & fabulous extras and then finishes with my favourite bit: the sweet stuff. What can I say? I’ve bookmarked heaps of the recipes and I’m pretty certain they’ll all be good, although I draw a line at spicy millet and mushroom burgers. I’ve tried, but millet and I do not get on. Rather more engaging is the grilled halloumi burger with chilli ketchup and tahini mayo – now they’re talking. Most of the sweet stuff is raw, but no less appealing for that. I definitely have my eye on the lemon and lime avocado mousse cake. Strangely, they had a recipe for chocolate cookie dough balls, which is very similar to one I’ve made recently and will be posting shortly. I like to think it’s a case of great minds! The chocolate fudge cake is baked, but made with white spelt flour rather than wholemeal, which I found slightly disappointing. Nevertheless, it sounds totally lush. As I had some Swiss chard in need of using in the fridge, I had a go at making their coconut chana masala with spinach almost straight away. I substituted the spinach for Swiss chard, obviously. As I expected, it was totally delicious. Creamy, spicy and very satisfying. We ate it with some brown basmati rice. That’s my picture, not theirs. Although the book is first and foremost a recipe book, there are anecdotes and tips for healthy living scattered throughout. Getting plenty of exercise and managing stress are obviously important to the twins and I for one could certainly benefit from both. It was good to get some reminders. At the back of the book is a great section on some of their favourite ingredients and how to use them. I know when I first came across nutritional yeast, for instance, I didn’t really know what to do with it, other than to make tofu scramble. Here we are told it’s particularly useful for vegans, because not only does it impart a “cheesy” taste to many dishes, but it’s also a good source of vitamin B12 and beneficial bacteria. Like many modern cookbooks, pictures of the authors abound. Handsome as they are, I could, quite frankly, do with less of them. They have, however, been flagged by The Times as “the poster boys for a healthy way of life”, so I guess it’s not too surprising in this instance. The photographs were taken by Alistair Richardson and the food images are all bright, clear and very appealing. The World of the Happy Pear by Stephen & David Flynn is published by Penguin as a hardback and retails at £18.99. 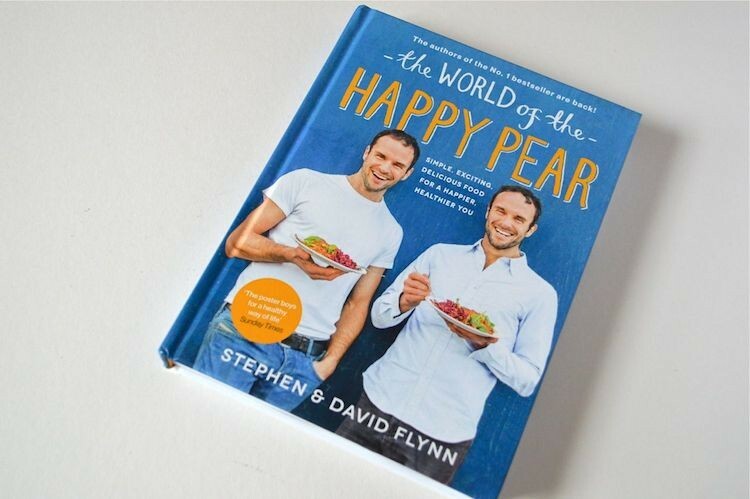 Penguin has kindly agreed to give two Tin and Thyme readers a copy of The World of the Happy Pear. To be in with a chance of winning, please fill in the Gleam widget below. You will need to leave a comment on this post, answering the question, which then gives you additional chances to enter if you so wish. Gleam will pick a winner at random from the entries received. If you are commenting anonymously, please give me some way of identifying you as I will be verifying the validity of entries. Any automated entries will be disqualified. This giveaway is only open to those with a UK postal address. Winners will need to respond within 7 days of being contacted. Failure to do this may result in another winner being picked. Prizes are offered and provided by Penguin and Tin and Thyme accepts no responsibility for the acts or defaults of said third party. Tin and Thyme reserves the right to cancel or amend the giveaway and these terms and conditions without notice. Thanks to Penguin for the copy of The World of the Happy Pear. I was not required to write a positive review and as always, all opinions are my own. I really love cauliflower pie. It is wholemeal pastry filled with cooked cauliflower, thick homemade tomato sauce and lots of grated cheese. I love it because it is so tasty and filling. I love vegetable chilli – hot and spicy and low calorie too! I love these two! I’ve been following them on Instagram for a while now, this book (and recipe!) look fab! I like to cook vegetable lasagna. It’s easy, tasty and filling and my family love it which is always a bonus. Vegan shepherdess pie – with sweet potato, potato and vegan cheese mash topping. I tend to use whatever veg needs using up, together with passata, mixed beans, lentils, onions, etc. It’s never quite the same twice – but unbelievably tasty. Vegetarian moussaka – We’re not vegetarians but this is so delicious my hubby doesn’t even notice!! I discovered Spinach lasagne and at friends dinner party and surprisingly I fell in love with it! She is a veggie and won’t cook meat so it was a delicious alternative! I even got the recipe from her so I can make it myself. Tempura. I love fried food. It’s my dream to be sat at the table impatiently instead hunched over the pot of hot oil taking orders and never getting to taste them. My favourite is stilton and leek lasagne which is really tasty and satisfying. Vegetable risotto is one of my favourite veggie dishes. Last week we made one with a.o. fresh asparagus and kohlrabi (remember to put a good splash of white wine in !) and, as we were in Denmark, a few slices of Blue Castello on top of it all. That sounds like an interesting combination Henk and not one I’d have thought to try. Risotto is usually a winner. I’ve wanted this book for ages… they are rather charming looking aren’t they? Great review. My fave veggie recipe is a veggie hot pot. Warm, hearty, healthy and full of the goodness of vegetables! Thanks Dom. I’ve heard they are very charming in person too. Good luck. My favourite vegetarian recipe is my home made vegetable lasagne, made with whatever veg is growing in the garden. Lentil and Chickpea Chilli. It’s so versatile, serve over jacket potatoes, rice, cous cous, fill wraps etc and it always taste even better the next day. I love quiche with new potatoes & green salad. Not only is it summery, which is a joy, but it is a good meal that is not too filling. Thanks for a fantastic giveaway, the book looks AMAZING!!! After hearing so much myself, it was great to get my hands on a copy of one of their books and I do like their style. I love their chocolate mousse so tasty and much healthier than normal mousse. I would love to try out all their new recipes. I love to cook vegetarian rainbow bowls, filled with different kinds of cooked/raw veggies, grains, beans, usually hummus or guacamole! Ooh, I like bowl food and am now quite familiar with the term Buddha bowls, but I’ve not heard of rainbow bowls – fab name. I’m a soup maker so I love using fresh vegetables to create beautiful soups. My favourite is Jerusalem artichoke with parmesan – earthy, nutty and creamy. i love macaroni cheese, its simple to make filling and tasty ! My favourite is my Thai green curry with puffed tofu. It is absolutely lovely and looks impressive but I have to say it’s not my amazing culinary skills make it that way, it’s a great recipe I have that although made entirely from scratch is really easy to do. Love Thai green curry Caroline, but you now have me intrigued and wondering what puffed tofu is. Looks like some nice recipes inside. My fave (and easy go to) is risotto. So versatile. A simple mixed bean stew – so comforting, filling, healthy and seems to go down well with everyone (even the kids!). My partner’s yummy garlicky mushroom and tomato sauce for pasta. Really tasty and handy for if my vegan daughter visits. This book looks fab i’d love to have my own copy. I’m a big fan of the happy pair guys, my mum introduced me to them a few months ago and I love their instagram feed. Beans on toast. I know it’s not fancy or difficult to make, but it’s always comforting and tasty. i love vegetarian lasagne – its easy to make and its fairly cheap too! My lot took a lot of persuasion to try veggie meals but now they love them. Quorn Moussaka and home made Glamorgan Sausages are always a hit. Well done for persisting Natalie. I haven’t made Glamorgan sausages for years. Thanks for reminding me. A stir fry as is packed with lots of colours. I love a home made leek, potato & onion soup. I love vegetable soups, especially butter-nut squash and leek and potato. Rose Elliott’s lentil soup recipe. Easy peasy and wholesome. Root vegetable curry – even though the family is not vegetarian we all love this. We love pumpkin, feta and filo pie because it’s so tasty with a crispy topping and goes well with salad in Summer or steamed veg and tomato sauce in Winter. Ooh, you’ve totally sold me on this one Sue. Really want to try your pie now. Vegetable Lasange, as delicious and filling. Great with a side salad. I enjoy a vegetable biryani – a great way to use up all the tiny potatoes in the veg crop. my favourite veggi meal (excuse my spellings) is Rattatwee (I know its wrong) because just love to add a variety of vegetables for taste and texture. Roasted peppers stuffed with cous cous is delicious and a hit with all the family, even my 3 year old! Probably sweetcorn and kidney bean curry with chappati – totally delicious! Sounds delicious, I particularly like the idea of ginger brown rice. Ooh I do like the sound of your Pancakes Ruth. Will have to try. My favourite would have to be a vegetarian curry, with a vegetable Biriyani. Yum. I love ratatouille, its such a warm and comforting dish, very versatile, I serve it with crusty bread, cous cous or in a veggie lasagna. I love potato and spinach curry….it’s tasty, healthy, easy and cheap!